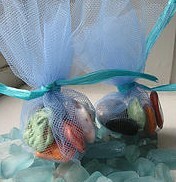 Welcome a newborn with delightful chocolate candy baby shower favors. There are a number of different ideas to choose from for a chocolate party favor to celebrate the arrival of your precious new baby. No, perhaps the baby won't know the difference, but all your friends will love receiving an adorable, edible treat as a token of the joy a new baby brings to your life. Whether you want chocolate candy baby shower favors for the proud dad to pass out at the hospital and to all his friends, or something a little different for the guests at the baby shower, these ideas will give you a good start in the right direction. A really fun idea that I have enjoyed on a few occasions are custom chocolate bars. You can get these delicious chocolate candy bars printed up especially for your child. You can include the name, birth date, weight, length, etc. (For us girls, that is the last time we want our weight printed anywhere!). You could even include brothers and sisters names so they don't feel left out. These are such great chocolate candy baby shower favors because nearly everyone will be pleased to receive a candy bar, though they will probably only save the wrapper as a keepsake. These usually run about $1.50 each depending on the quantity ordered. You can find them at Memory Wraps. You can save a bit if you just order the wrappers and then wrap your own chocolate bars. The wrappers are less than a dollar each without the chocolate. If you really want to save, and think you may like to use this chocolate party favor idea on different occasions, I recommend that you go ahead and order the software from Custom Candy Wrappers, and print out your own wrappers any time you need them. You can purchase Hershey chocolate bars as well as your other favorite candy bars in bulk at Candy Warehouse. But to be completely honest, you can probably get as good a deal at your local grocery store or Walmart if you pay attention and watch for specials. Another cute and clever idea for chocolate candy baby shower favors is using Hershey's kisses. Of course, this is much cheaper than the candy bars, because you are getting a lot more for your money. Once again, these can be purchased with or without the chocolate. 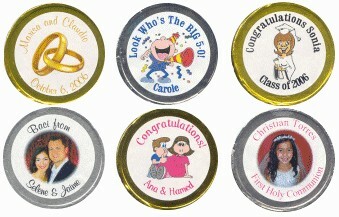 You can order the custom stickers from Custom Candy Bar Wrappers and then stick them on the chocolate kisses yourself. If you can't be bothered with the fiddly work, just order them already ready to go. 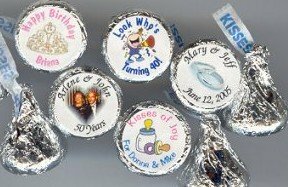 If you are interested in assembling this chocolate candy baby shower favor yourself, I want you to know that you can get Hershey kisses at the Candy Warehouse in a wide selection of flavors (and colored foil wrappers). Like chocolate kisses, chocolate coins are a pretty good choice for chocolate candy baby shower favors if you are trying to work on a strict budget. You can incorporate the same stickers mentioned earlier from Custom Candy Bar Wrappers, but use them on these chocolate coins instead. You can get some nice coins from the Candy Warehouse. They have a variety to choose from and special prices for buying in bulk. They're one of my favorite sellers. Maybe you are a traditionalist, and can't get past the idea of dad handing out cigars after the birth of the baby. No worries! 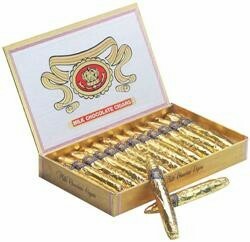 Just order up a selection of chocolate cigars from the Candy Warehouse. If you still want the personalized touch, use your custom stickers from Candy Wrappers as the label on each chocolate cigar. Voil`a! You've got yourself some traditional yet modern chocolate candy baby shower favors! Molded chocolates are always a special treat. I sometimes find them difficult to eat because they are so lovely. Never fear, I ALWAYS overcome my reluctance and give in to the wonderful temptation of chocolate. You may choose molded chocolate candy for your chocolate candy baby shower favors. You may want small bite-sized chocolates or even chocolate lollipops. There are a number of different shapes to choose from that would really be cute to celebrate a new baby in the family. If you want the molded chocolates without the trouble of making them yourself, look at the choices available at eBay! You'd be surprised how many good chocolate deals you can find there. :-) It's one of my little secrets. You may enjoy the fun of making them yourself. In that case, do look at the wonderful selection at my favorite mold suppliers Candyland Crafts, and One Stop Candle. You can choose from an umbrella, a stork, a baby, a bassinet, a bootie, a bottle, you name it. If you don't find the mold you are looking for just ask at Candyland Crafts. They will even make a design up special just for you. What more could you ask for? Perhaps none of those other ideas appeal to you. Maybe you already have something specific in mind for chocolate candy baby shower favors that you want to make yourself. Fair enough. What do you need to get you started? You will find boxes, bags, ribbons, twist ties, whatever you need along the lines of favor supplies at Candyland Crafts. If you can't find what you are looking for, just ask them. You don't necessarily have to spend a lot of money to make chocolate candy baby shower favors. You can order your chocolates in bulk from Candy Warehouse and wrap them in cello bags with a pretty ribbon for pennies each. May I even suggest that if you want to make your own chocolate candy, browse through the delicious recipes on this site and choose one or two that really tempt you. Simply make up a batch and use them as your chocolate candy baby shower favors. Remember, there are no rules. You can adapt and adjust these ideas to suit yourself. Just be sure to celebrate the coming of your new little blessing! I congratulate you and send you all my best wishes. Do none of those ideas take your fancy? Maybe you will find a baby shower favor more to your liking at one of these other suppliers. Good luck! Birth Announcements, Photo Birth Announcements, and MORE! Sweet Memories - Personalized Party Favors and Birth Announcements. A fun and affordable way to sweetly thank your guests.